This page contains Amazon affiliate links which earn our company a small commission to cover operating costs, not affecting your price. 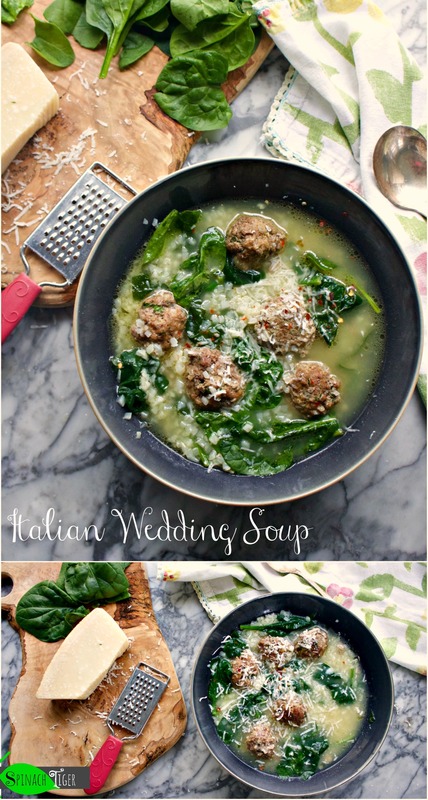 Italian Wedding Soup may or may not be “wedding soup” in the sense that it’s served at a wedding. In a loss of proper translation it’s a marriage of meat and vegetables. It hails mainly from my maternal great grandmother’s area of Naples where food was never wasted, always tasted delicious and fell into that soulful memory making category, peasant food. This is my jam. These are my people. No wonder this resonates with me so much. There were most likely version with different types of meat and sometimes scarce meat, but always always vegetables. There were times different types of meat would be thrown in, especially varieties of pork, which is why I made my meatballs with prosciutto. Prosciutto meatballs have popped up here before. Here with savory blueberry sauce and here with homemade paparadelle. I chose to only use spinach but there are days I want escarole or lacinato kale. Just make it green. There are days the broth is homemade using my chicken bone broth, and there are days I use an organic chicken stock. I have a few different meat ball recipes that you can choose from, aside from the proscuitto meatballs I’m presenting here. Paleo Meatballs, turkey meatballs, chicken meatballs, traditional Italian meatballs are all options. Just make them small enough to use each for soup. When I need really easy, I use the store bought organic chicken stock, and baby spinach which needs no trimming. I can’t eat store bought meatballs, and they are too easy to make. Once the meat is mixed, the small meatballs only take ten minutes in the oven. You can make extra meatballs and keep them frozen. I used riced cauliflower, which means I only need to empty a bag of cauliflower into into the broth, but on the days I use pastina, I will boil that separately, because it will absorb a lot of broth. As far as packing in more vegetables, you can add carrots and celery, but I don’t typically do that. I do, however, use a really good parmesan cheese, freshly ground. I also like to add a little crushed red pepper. I used the cauliflower rice for a lower carb version today. Just make sure the meatballs you choose to use don’t have grains. I boost the fat by drizzling a olive oil into the soup. Consider using a little garlic infused olive oil or chili infused olive oil, which will add a little more flavor and zest. 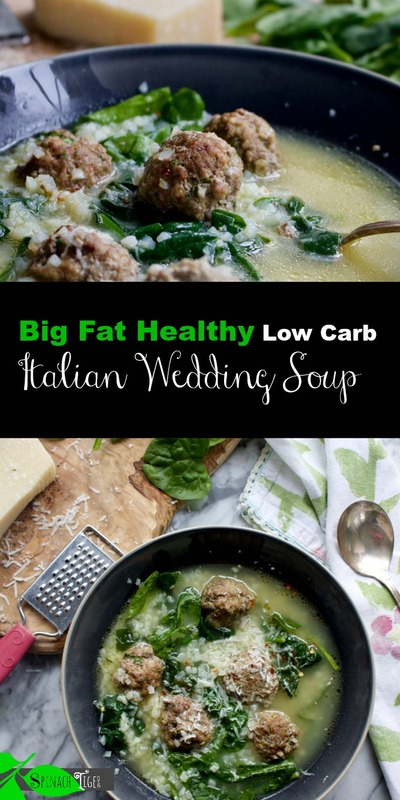 Enjoy one of my favorite and easiest big fat healthy Italian soups! 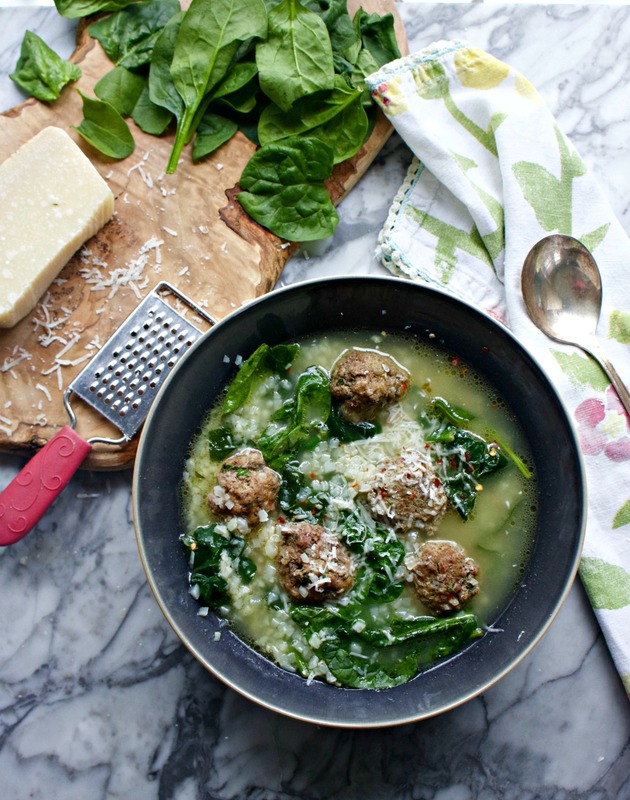 Make meatballs, by combining all ingredients together, keeping the meat loose. Form into small balls and bake at 400 degrees for 10 minutes. Heat broth with riced cauliflower. If using pasta, cook pasta separately according to instructions and spoon in, about ¼ cup cooked per soup bowl (or desired amount). Add in meatballs. Taste for seasoning. Add salt, pepper as needed. Add spinach at very last second. You can even wait to add spinach as you serve. Serve soup with parmesan cheese. this was delicious. i cooked it in my instant pot on pressure cook for 5 minutes and it came perfect. 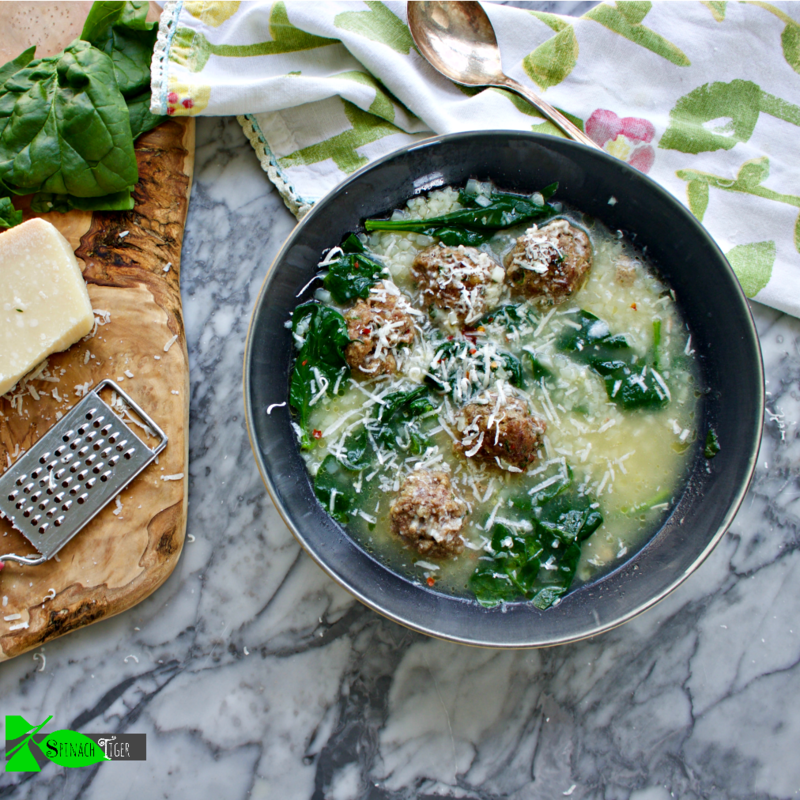 love the prosciutto in the meatballs! Thank you!So glad you enjoyed. Oh my goodness! We had this last night and it was DELICIOUS! There were ZERO LEFTOVERS. Even my daughter, who is extremely picky, ate every last bite and then asked for more. We will definitely be having this on a regular basis. Thanks for a great low carb soup! Thank you Melanie for letting me know. Hi! This looks delicious and simple both. I’m going to make it soon. I have a question though. Is it possible that you mean 8 *cups* of broth instead of 8 quarts? Thanks for clarifying. I think it should have been 2 quarts. I love the green look! Seems delicious! I have to try it! Thank you for sharing!